Why does it so often seem that after a mass shooting happens, people are so shocked about the killer’s actions? That’s been the case in many investigations, most recently the shooter in the Las Vegas massacre (I don’t even want to mention his name). His neighbors have expressed shock that someone in their quiet neighborhood committed such a horrific act. Even his brother has said multiple times in interviews that he had no idea about his brother’s gun obsession or evil intentions. About a year ago there was another shooting – I don’t even remember the details because unfortunately they seem to happen frequently – and I had similar thoughts about the shooters’ loved ones/acquaintances. What must have gone through their heads when they heard the news. The initial shock at seeing someone they knew being accused of a heinous crime. Then the denial that they actually committed the crime – there must be some sort of mistake. Then anger – what were they thinking?! – and then, as time passes, the acceptance of what happened and having to move on from that. Nearly a year after I bought myself a interface so I could record songs at home, I finally sat down and recorded some of my recent songs. Our house is in a bit of an uproar, since our whole downstairs is in boxes and all over the place because of recent water damage and the new cabinets and floors are in the process of being replaced. So it took a little while to find all the parts – the microphone, the microphone converter and the guitar cord – and it took a few minutes to set up everything up. Fortunately there are some tutorials on YouTube so I could figure out all the settings. Yesterday I figured out the basics and was ready to record today. I only had a few hours of the Ableton live trial left so I set aside some time this morning to record the songs. When I turned on my computer, I received a notice that my computer detected a virus and needed to scan the computer so I got that started. For the next few hours, as I was trying to record the songs, a pop-up screen popped up every minute or so so I had to keep closing it. With an hour or so left of the trial period – and many takes on the recording – I finally got one I thought sounded good. I went to save it and my computer crashed. True story. A blue screen error (I found out that was what it was called as I troubleshooted on my laptop.) The virtual assistant gave me instructions on what to do after the computer restarted a few times and didn’t show me the start screen, but my computer never restarted so that didn’t help. So I just shut down the computer. Things seem to be working so far, but unfortunately the last recording didn’t save so I had to set everything up again and try it again. One of the things holding me back about publicizing my songs on YouTube is that I’m hesitant to make a video. I not all that tech savvy about making videos and I don’t want to just have one of me sitting in my living room playing guitar. Then it dawned on me that I don’t really like most pictures of me in general and maybe that’s holding me back in other ways, too. If I wanted to be a Vine or Snapshat or Instagram celebrity (I don’t), you can’t really do that if you don’t like pictures of yourself. And today’s society is all about the pictures – it wasn’t as much of an issue 20 years ago when I was in my 20s. I’ve read some articles recently about how those “candid” snapshots of people often take a lot of work to set up and so it’s not really all that real at all. Anyway, that’s what I had in mind when I wrote this song, “A Pixelated World.” That in this world where everybody is constantly sharing photos of their life, it’s often more the photos of how they’d like their life to be rather than how it actually is. And how these “sunny snapshots” are mixed in my Facebook timeline with the distressing news stories of the day. When I write songs, I usually write the lyrics and melodies first and then write the music afterward. Since my guitar chord ability is limited, this often causes many of my songs to have similar sounds. So I thought I’d try something new and start with the music this time and then add the lyrics. I even learned a new chord – C, which used to be a big challenge for me but somehow I’m able to stretch my fingers to play it now. So here it is – I started playing the C, came up with chords that sounded like it went with it then the first line came to me “I never knew what you believed in” and went from there. I finished the first version of the song the same evening – once I had that first line – and a recent news headline in mind – it almost wrote itself. In the following week, I tweaked a few of the lyrics as I sang/played it over and over certain parts needed to be smoothed out. One thing that took awhile was the bridge. I never purposely wrote a bridge into a song before. I knew songs are supposed to have one, but was never really clear on what it was. I tried to grasp it and it took several days to come up with one, both the music and the lyrics. Still not sure if I got it right. Tonight’s studio recording class at the community college was VERY technical. 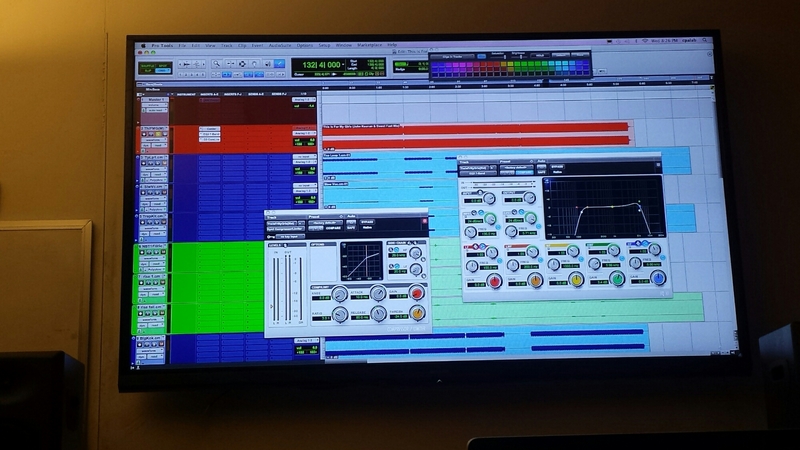 A look at how Pro Tools works. My husband went with me to this one, as he’s interested in helping me record my songs. I’m very grateful for that because this aspect of the process makes my head spin. Or in tonight’s case, my eyes close because I was so tired and was having trouble staying awake. No reflection on the instructor, as he was energetic and funny and really knew his stuff. It had just been a long day of work and kids on not much sleep. But it was interesting to learn about how this part of the recording process works, even if I didn’t understand much of it. I typically learn something better when I’m actually doing it, rather than listening to how to do it, so maybe if we get the interface needed to connect the instruments to the computer and we get ProTools, then I’ll get a chance to play around with it with my songs. Maybe use the metronome click to keep my tempo the same throughout the song and do some compression and EQ and use a gate to control the thresh. Did you notice some of the technical terms there in the last paragraph? Anyway, I have newfound respect for all the sound guys and producers and whoever else is involved in making songs sound good. Very impressive work. One interesting piece of advice I heard tonight, too, is to listen to other songs in the genre that you want to work in and pay close attention to those that are successful to see how they are made. That seems like it should be obvious, but I’ve never thought of my songs in that way. I usually just get an idea or a melody or a first line and then go from there until I feel like it’s done – changing lyrics along the way, but not really planning which direction to go in. So I’m going to try doing that – maybe actually trying to craft a song from the start and see what happens. Tonight in my songwriting quest, I went to a song-in-progress workshop hosted by the local songwriters’ association. Guests are invited to bring one song – either recorded or playing it live – and songwriting experts and other participants critique it. I brought a recording of my most recent song, “Among the Shadows,” which my husband and I recorded in our living room last night. I’ve been working on it for a couple of weeks now and my husband added his guitar, which added a whole other dimension in my opinion. This was the first time playing one of my songs with somebody else so that in itself was fun. Back to tonight. As I expected, the group as very supportive and it was cool to hear everybody else’s song-in-progress. The main critique of my song was that the chorus and the verses sound too similar and need some more differences between the two. Not a big surprise as I used the same chords throughout, although I tried to switch the order in different places. One person really liked the lyrics and the message behind them. One person said he liked my singing voice and that the song had a Pretenders sound to it, but he was waiting for the big chorus, which never came. Who is the singer singing to? Definitely things to think about when reworking my songs and rewriting new ones. A few weeks ago, I contacted a legendary music producer after hearing a radio interview with him and really being impressed with his passion for music and helping songwriters. After a few emails back and forth trying to set up a time to talk, he ended up calling me and we chatted for about an hour. I don’t want to say his name at this point because it’s too early to do so, but he was so nice and so gracious and I was so appreciative that he took the time to not only listen to some of my songs but to talk to me about them and give me advice. Since my songs have always been a really personal thing for me and something I’m not used to sharing with others, it was really a life-changing conversation for me and got me thinking about what I really want to do with them. After our conversation, I started reading more about the business – both in the Songwriters Market, which I bought a couple weeks before that, and online. He had also given me an idea of what the process is to record a song at his studio, which ended up being way out of my price range. We renegotiated by cutting down on some of the instrumentation, but it’s still not an amount that is readily available for me, especially right now when there are still some weeks this summer that I haven’t arranged for summer camp for the kids. So I was totally bummed that I couldn’t just jump into this project – did I mention that he was interested in recording one of my songs? Oh, I didn’t mention that? Oh, well yes, this legendary producer thought one of my songs had some potential and although I wasn’t clear on some of the vocabulary he used to describe it, the end result is that he thought it had potential. So anyway, there I was the day after discovering that even the lower price was currently out of reach, and I found in my work inbox a free “No Experience Necessary” class at a local community college about studio recording. It’s one evening a week for the month of June. Next week the topic is mixing and recording (so maybe I’ll understand some of the vocabulary if I ever get to work with said producer), then the following week there will be a singer-songwriter performing and we’ll learn about how recording conditions and equipment changes the sound of the recording and the final week is about electronic music. Meanwhile, I’m in the process of writing a new song – this time my husband is playing lead guitar so it is sounding better than ever – and I am really excited about how that is turning out.